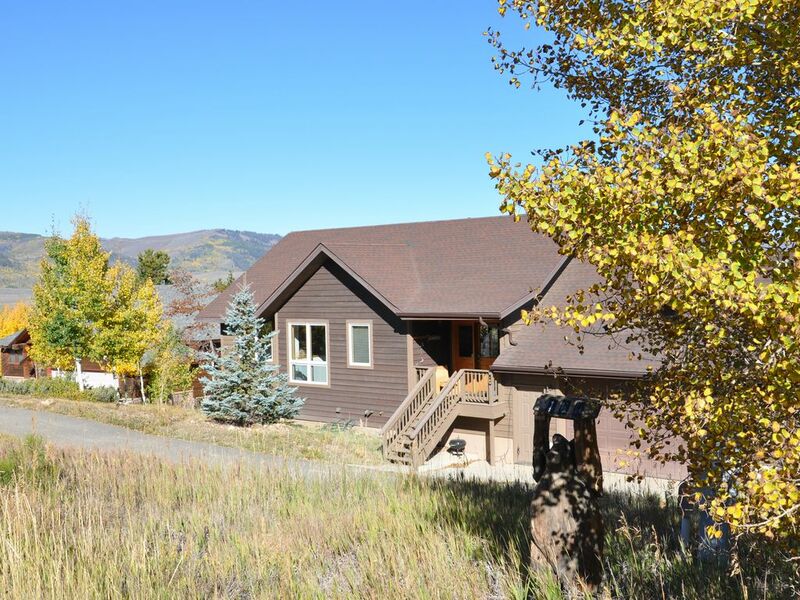 Here is a year-round, extremely clean, and fully-furnished, private home you will love to come home to.This mountain home is only two minutes from the Granby Ranch ski slope, and Granby Ranch golf courses. Pole Creek Golf Course is just ten minutes away.Our house is 20 minutes from Winter Park Ski Resort or 20 minutes to Grand Lake or Lake Granby or Rocky Mountain National Park. Granby, Colorado is 5 minutes away. This private home has a two-car, attached garage.From the large front door entry and deck you enter a spacious living/dining/kitchen area.Built in 2000, our home is in spotless condition. The living area has a gas fireplace, Cable TV, and a patio/deck that looks out to the valley, mountains, and lake below.Excellent for families and entertaining. wireless Internet access available for your laptop. Downstairs is a private master bedroom with patio doors that open to a field of aspens where the local fox roams and the elk wander. The large master bath has a walk-in shower stall, double sink, and a jetted tub.The second bedroom has a queen-size bed and the third bedroom has two bunk beds, one of which has a full size bed on the bottom.All bedrooms have lovely views of the mountains. There is a bathroom with tub and shower between bedrooms two and three. The fourth room downstairs has two twin beds if you desire to use it, otherwise it makes a good quiet room for reading or play. There is a laundry room downstairs fully equipped with washer & dryer. There are 4 sleeping bags in the bunk room if needed. Every window looks out at a beautiful mountain scenery.Sit on the patio/deck and enjoy the hummingbirds buzzing around you in the summer, or go for a hike and enjoy the many wildflowers in bloom or snowcapped mountain slopes and peaks in the winter. This home is warm, comfortable, and welcoming to you after a long day of play. The large dining room table seats 10 and additional seating is available at the counter or at the patio table on the deck. Cook in the fully-equipped, gourmet kitchen with granite countertops, or eat at one of the fine dining establishments nearby.The living area has a gas fireplace that will take the chill off after a long day of skiing. Enjoy this luxury home in any season and you will have an experience you will remember for a lifetime! My husband and I love the mountains in the summer time - our grandkids are very close to our mountain house. We purchased this house for a weekend getaway - we live in Boulder. We love to entertain family and friends at our mountain house - it is very family friendly - so much to do nearby summer and winter - we often have Thanksgiving here. Because of the beauty of the surroundings and the people! Relaxation, hot springs, mountain hikes, snow shoeing, skiing, sledding, snowmobiling, Sleigh Rides and more, all within minutes! Somewhat rural, with all the amenities nearby of a full grocery store, and yet not isolated. From all of our renters, the most common comment is how amazing the views are from our house. You will not be disappointed! Snowshoes and poles in garage for your use. Many times we have multiple families sharing the rent making this a bargain! We always receive rave reviews for the house, views and accommodations. The most common comment is "It exceeded our expectations!" Plenty of sleeping space. Perfect great room for games, movies, meals. Thank you Ron for bringing your family to stay at our home! We enjoyed hosting you. We couldn’t have been happier with the home we stayed in! It had everything we needed and was the perfect location to go just about anywhere from Winter Park to Rocky Mnt. Nat. Park and all points in between. Perfect! Thank you Keith! We enjoyed hosting your family and hope to see you again soon. Great house, very nice location. This is a great place to stay. The house is wonderful. You can sit on the deck and watch the swallows both in the morning and evening and watch the hummingbirds all day, if you want. Great location, too. Winter Park in one direction and Rocky Mountain National Park in the other. Beds are very comfortable and the shower in the master bath is high enough for my 6'5" son to stand under. Very clean and well kept. Highly recommended. Thank you! We are so glad your family enjoyed our home and we hope you return soon! Wonderful home, great owners, and terrific location. We enjoyed our stay at this fabulous home. Centrally located in the valley and close to many great things to do. Home was perfect and owners were very good to work with. We will be going back to this home soon! It was a pleasure hosting you and your family in our house. Thank you for the lovely review and we look forward to hearing from you again on your next trip to Grand County, Colorado! We love having you! Thank you for visiting our vacation home. We appreciate your review as well! Rose & Howie. No animals allowed and no smoking of any sort There is always a danger of forest fires so you may not smoke outside the house either.